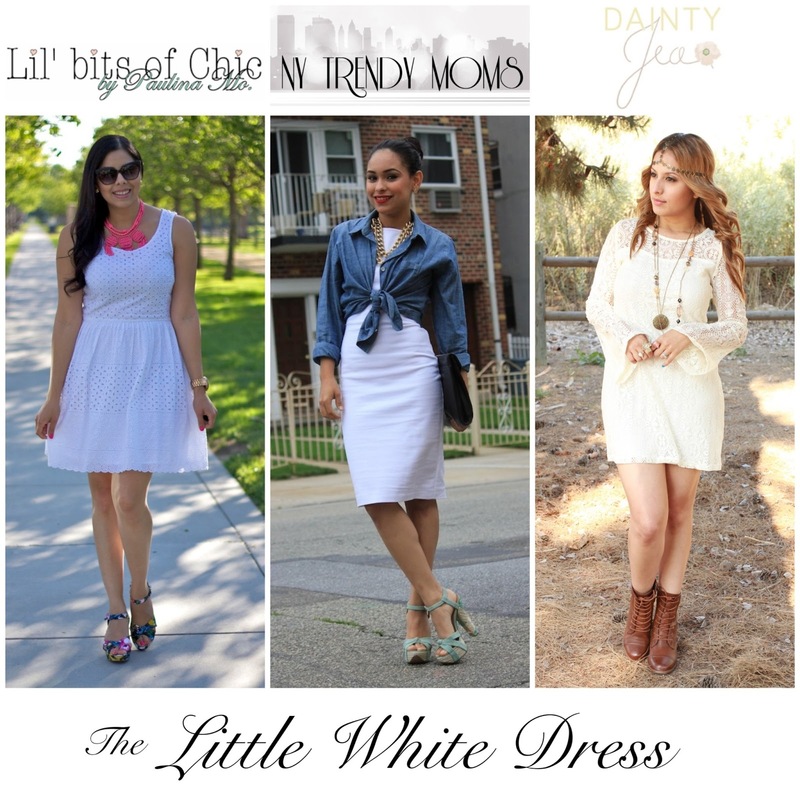 With Summer around the corner, the Little White Dress has become the new Little Black Dress. Much like the LBD, the LWD is versatile- you can dress it up or down, layer over it and accessorize it to your liking and style. To show you its versatility, I was excited to collaborate with two fashionable bloggers NYTrendyMoms and DaintyJea to bring you 3 different ways to style your little white dress! I describe my take on the little white dress as daytime fun in the sun. This little white dress is the classic eyelet fit and flare, amped with some color via the hot pink statement necklace and floral platforms for a playful summer vibe. Johnnybell from NY Trendy Moms layered a chambray and a gold necklace for a polished casual look- superb! Jealeyni from DaintyJea accessoried her little white dress with gorgeous necklaces and a headpiece for a boho feel- stunning! Make sure to check out more pictures of their looks on their blogs! Your eyelet dress is perfection! You look beautiful! super adorable so girly i love lace!! All of you look beautiful, and I love each one of your looks! Look at those wonderful shoes! I love white dresses, I would love to get one but I do not think my pale skin is the most suitable thing to compliment it! Very nice looks done by all! Now I need me a LWD!!! Love the eyelet dress with that sudden pop of neon pink. Very pretty! Such a great collab! We need to do more.